US federal debt held by the public is at a peacetime high of 75 percent of GDP, and the Congressional Budget Office (CBO) expects it to reach 86 percent by 2026 before soaring to 155 percent by 2046. Similarly, CBO projects annual deficits to triple in the next decade, from $438 billion in 2015 to $1.36 trillion in 2026. Entitlements and interest are the most widely discussed drivers of this fiscal outlook. However, the roots of today’s fiscal problems go much deeper, both historically and politically. When looking at the history of deficits and debt, most studies focus on the modern budget era (1974 onward) using either inflation-adjusted dollars or debt as a percentage of GDP. 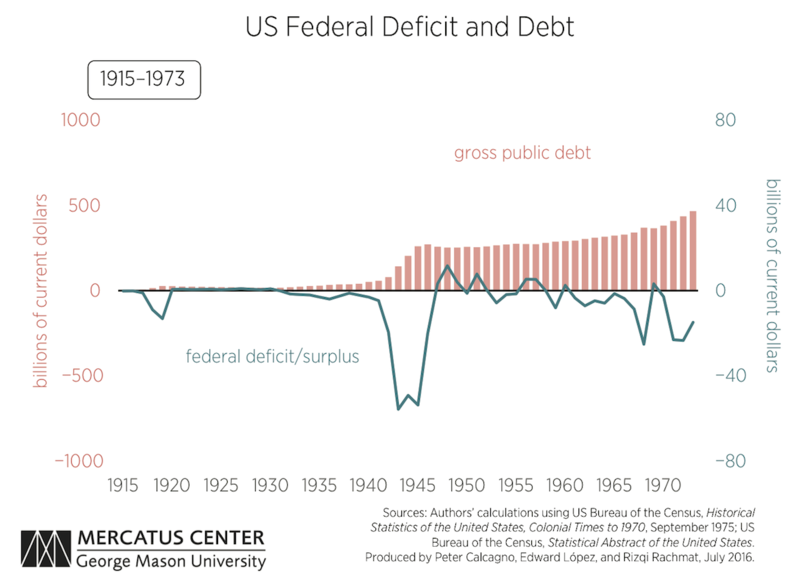 Instead, in our recent Mercatus Working Paper, we present deficits and debt using dollars not adjusted for inflation, going all the way back to the nation’s founding, because the nominal figures offer a way to compare short-term fiscal patterns over a long period. We find that deficit patterns gradually transform from infrequent deficits during emergencies to systematic deficits every year. 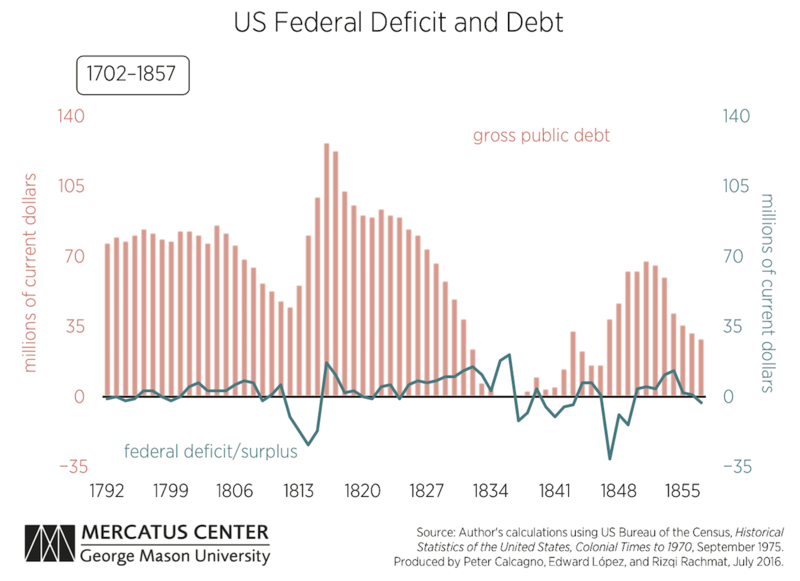 The first chart shows that for most of the nineteenth century, the pattern was to run deficits only during periods of genuine national emergency (War of 1812, Mexican-American War, financial crises of the 1840s, and Civil War), but to run surpluses during normal times to pay down the accumulated debt. 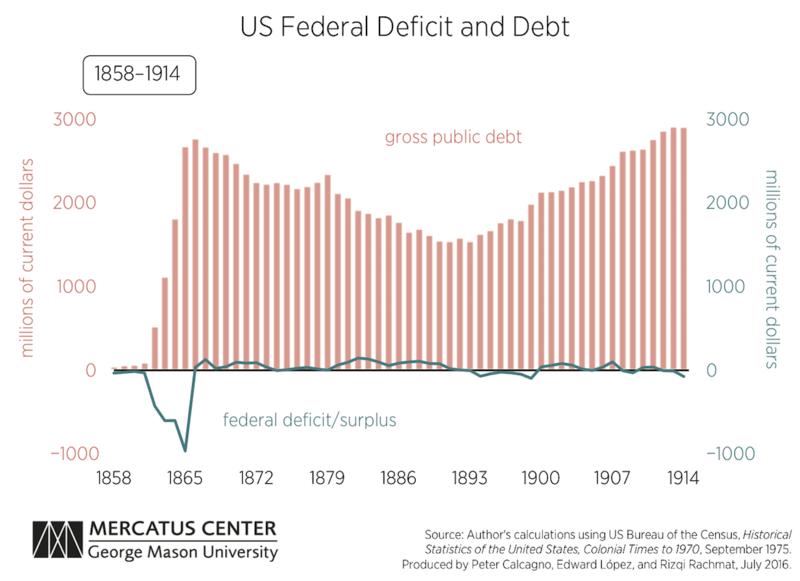 However, as the second chart demonstrates, between about 1880 and 1914, deficits became slightly more routine, and accumulated debt was paid down more slowly. After the exceptional period of the two World Wars, peacetime deficits became even more frequent and grew larger in magnitude, as seen in the third chart. Finally, the modern budget era, in the fourth chart, features large and growing deficits every year since 1974 (except 1998–2001), in both emergency periods and normal times. We trace the political roots of this gradual change to the decades surrounding the turn of the twentieth century. Between about 1880 and 1930, two informal rules that govern fiscal policymakers shifted. First, new norms of federal spending began to emerge in the electorate, as new demands for spending emerged in the areas of economic security at the household level and economic stability at the macroeconomic level. Second, norms began changing within government as well, as elected office transformed from a temporary duty into a career-long endeavor. By the early decades of thetwentieth century, current voters and professionalized politicians had powerful incentives to increase spending. The new informal norms were thereby codified into durable legislation that would determine how future policymakers must spend. This is the root of entitlement programs and debt-financed stimulus, and this is how chronic deficits got their start. 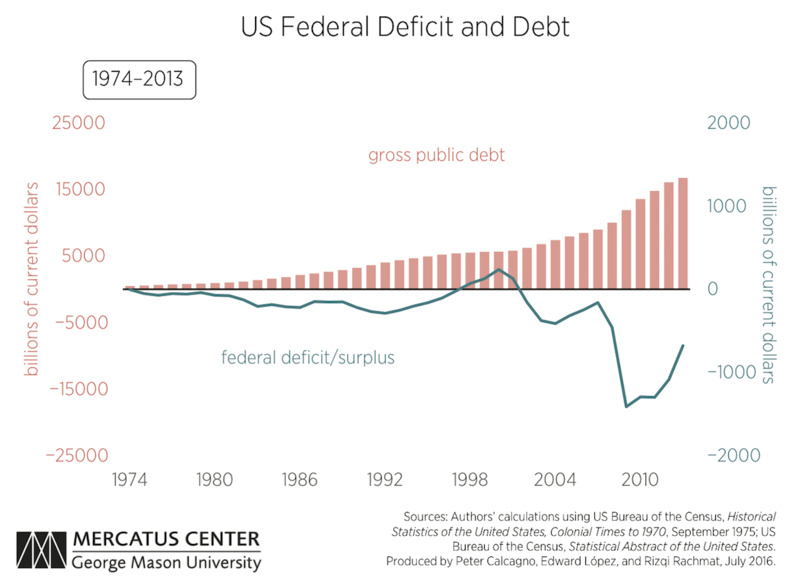 Although the modern budget era has seen numerous legislative and constitutional attempts to constrain spending—or shifts in the formal constraints—the reality is that policymakers have difficulty controlling deficits, and federal debt has marched steadily toward unsustainable levels. In short, informal rules have trumped formal constraints. Whether today’s policymakers intend or realize it, the evolution of informal and formal fiscal rules continues to shape today’s fiscal policy outcomes. This has led to chronic deficits, mounting debt, a dizzying complexity of tax and budget procedures, and unsustainably large unfunded obligations—all leading toward an overall bad and worsening fiscal outlook. Any serious discussion of reform must start by recognizing the current incentive structure embedded in the budget process. Piling on more formal constraints, without addressing the shifts in the informal rules, will be futile.